Members of Christian metal band Whitecross who will perform in Dimapur on April 12. 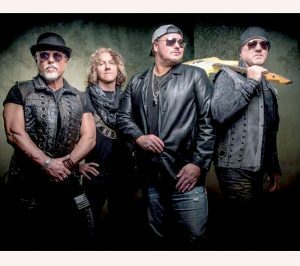 Dimapur, Feb. 9 (EMN): Perfectly in tune with the irony and contradictions of our time, it is fitting that the (American Christian metal band) who famously sang about “No second chances”, should indeed be the one serving up the first chance for fans in Nagaland to see them live. Yes, Whitecross is in town. In Dimapur. On April 12. The venue? Of course, where else but the Agri Expo site at 4th Mile. Needless to say, this is the first time that Whitecross will be performing in India. In a state whose 90% population subscribe to the Christian faith, for whom music is as essential as the Bible and the family, it is of little wonder that music bands such as Whitecross are household names—and the band’s songs widely covered across many Naga religious gatherings and worship events. The people behind Whitecross’ pending performance in Dimapur are from the newly formed “In the Kingdom Group.” A statement from the group on Sunday informed that the sole purpose of the concert was to revive Christian ethics among the modern day youth, through meaningful gospel music. Further details concerning what is expected to be a huge music event were not forthcoming from the organisers. Formed in the year 1985 in Illinois, US, by lead vocalist Scott Wenzel and guitarist Rex Caroll, Whitecross have three Dove Awards—one of the most reputed awards for gospel music, to their credit. Some of the band’s best-known hits include songs like: In the Kingdom, Simple Man, No Second Chances, Attention Please, Take it to the Limit, and He is the Rock.